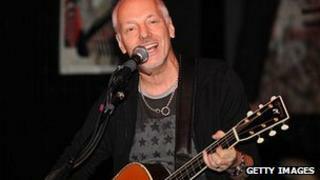 British singer Peter Frampton has sued the Universal Music Group for unpaid digital royalties, according to US reports. Nashville newspaper The Tennessean said the star has filed legal papers at a Los Angeles federal court, accusing the record company of "breach of contract". He argues that he should receive a higher royalty rate for digital downloads than for physical copies. A lawyer for Universal Music Group could not be reached for comment. In the past, record labels have argued that online sales should be treated the same as physical album sales. But artists say that, because online music does not incur packaging and shipping costs that are usually paid for by the record company, they should be entitled to larger royalty percentages. Frampton is seeking damages and has hired music lawyer Richard Busch, who has represented Eminem and The Knack's Bruce Gary in similar court cases. "The issues in these cases go beyond simply breach of contract," Mr Busch told the Tennessean. "The plaintiffs allege the wrongdoing here is a part of deliberate effort to deprive the parties of their royalties." Mr Frampton, first signed with A&M Records, a division of Universal Music Group, in 1971. He went on to record rock classics such as Show Me the Way and Baby, I Love Your Way. His 1976 album Frampton Comes Alive! is still one of the best-selling live albums in the US. The newspaper said the star signed a new contract in 1998, which stated that any "licensed" music would give the singer a 50% royalty. But the lawsuit has claimed the company paid less than the agreed percentage and it "systematically and knowingly" breached its contract with Mr Frampton.